One of the girls at this party introduced us to a card game that could only be described as a cross between Pictionary and Telephone. Remember Telephone? The game you played in 2nd grade, sitting in a circle on the colorful carpet? I loved that game. Problem with this new game was that it didn't have a moniker. Regardless of it's no-name status, it was one of the most hilarious group games that I've ever encountered. No alcohol required, either. Let me describe it. You think of a phrase, a song lyric, or a saying: "Don't Cry for Me Argentina" or "Don't Count Your Chicks Before They Hatch". Each person has a stack of notecards, corresponding to the number of people in the circle. 7 people = 7 notecards. Odd numbers of people are better and you need at least 5. The phrases used down below were "No One Puts Baby In A Corner" and "Good Things Come to Those Who Wait". You write your phrase on your card and pass it to the next person. That person reads the saying and then puts that card in the back of the stack and draws, on a new card, their interpretation of the saying. 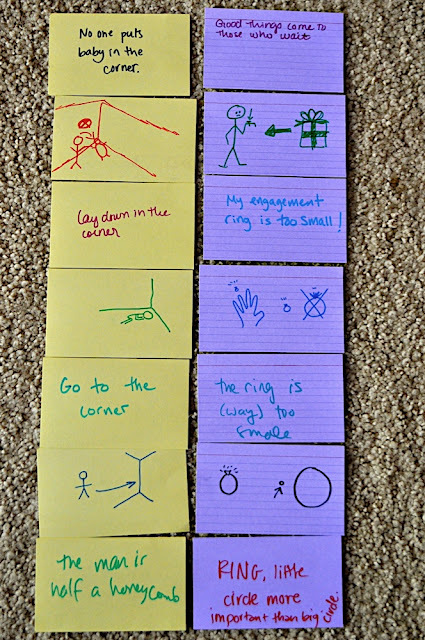 Example: On the purple card stack, one of the gals drew a gift (a 'good thing') for a person waiting (in this case, looking at their watch). Once your saying is in pictoral form, pass the stack to the next person. The third person can only see the drawing, not the original written version. So, looking at the picture, you have to decide what phrase is being described. So, "Good Things Come to Those Who Wait" turned into "My Engagement Ring is Too Small!". Once you write out your phrase, you pass to the next person, who now has to draw the 'new' phrase. This continues around the circle, until it reaches the original owner and you read and show the cards to your fellow 'artists'. 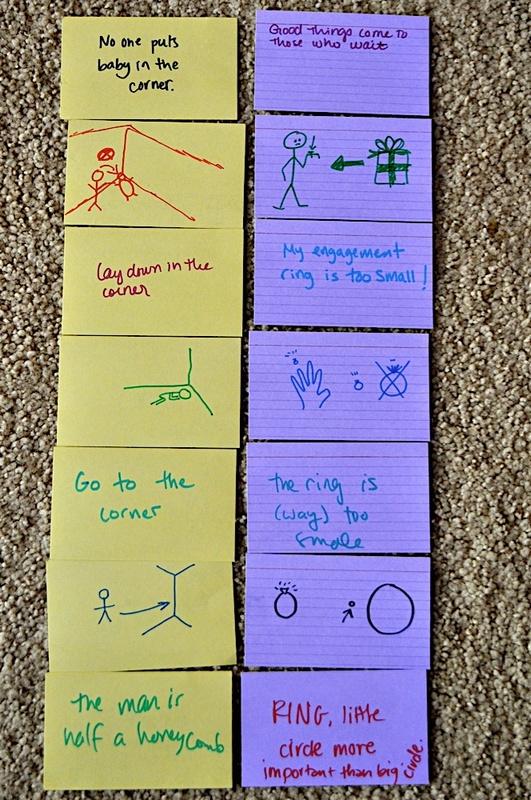 Since each person thought of a saying, and contributed to each card, you have seven sets of often hilarious drawings. Anybody ever heard of this? Because this game totally needs a name. It has a name now, thanks to Hasboro! They call it Scribblish. You should have marketed it while you had the chance! Someone is making money off of it now.